Yes! Prop 23—a proposal in California, underwritten by Texas oil companies, to repeal the strongest clean energy law in the nation—was resoundingly defeated on Election Day. But apart from that victory, media pundits seem to believe that around the country, environmentalists and their concerns were soundly trounced. I think they are reading the wrong tea leaves. Eco Moms express simple values: cherish natural resources; keep the world clean. The Tea Party may be full of science Luddites, but there’s another important activist group in the U.S. and it is growing fast. It isn’t run by anyone, and has no political candidates—yet. I’m calling it the Green Tea Party, and it is made up of millions of women I think of as Eco Moms. It is going to be–it is already–a game changer. I count myself among these women. EcoFocus Worldwide, a marketing research consultant, estimates that “the EcoAware Moms market includes more than 50 million women, 69% of [all] moms, and has more than $1.45 trillion in buying power.” Best of all, consumer power can translate to political clout. Most of us wouldn’t say we’re out to save the planet. And we don’t walk around numb with fear, gloomy about the future. Raising children is anxiety-provoking enough. But we want change. We want global warming addressed. We want to protect our homes from toxic chemicals. We want the government to which we pay our taxes to keep our families safe. Eco Moms teach our children not to keep the water running while they brush their teeth, to switch off the lights when they leave the room, to walk or bike to a friend’s house, to unplug chargers and shut off computers at night, not to let the engine idle at the mall. 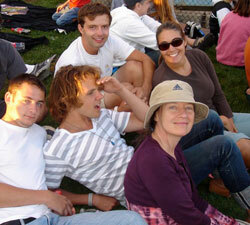 We’re about small actions that, within a family, express simple values: cherish natural resources; keep the world clean. These days, the news is full of reports that our lives are awash in toxic chemicals. They are hidden in plastics, in detergents, in beauty products, in foods—things no one worried about a generation ago. While there is only so much we can do, as individuals, about climate change, there is a great deal we can do about day to day pollution—especially exposure to toxic chemicals, whether they’re in baby shampoo, or in a child’s bracelet. When I read a recent blog post by Richard Denison, EDF’s senior scientist, about a new study linking the chemical bisphenol-A to low sperm counts, the first thing I did was send the post to every young man I know, beginning with my sons and nephews. No mom wants her children to be used as guinea pigs by the chemical industry; we want regulations that ensure chemicals are safe before they get under our babies’ skin. But make no mistake: right now, we’re all guinea pigs. Learn about toxic chemicals in consumer products and what you can do at I am Not a Guinea Pig. I had spent the summer ridding my own house of plastics with BPA (including those microwave popcorn bags with plastic liners), explaining to my sons the damage this chemical, an endocrine disrupter, can cause and how it can leach into food from plastic that is heated. BPA has even been found in some of the thermal paper used for cash register receipts—and it rubs off on our hands. BPA is only one of many toxins we’re bringing into our homes. Every day, Eco Moms are learning about problems with chemicals, networking for advice and information about safe products. New websites and new support communities are springing up to keep us informed about the latest findings. Judy Shils qualifies as one of the world’s most devoted and influential Eco Moms, and her work provides a model of how values are transmitted to the next generation. 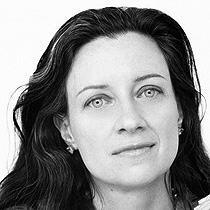 In 2005, while she was setting up the Marin Cancer Project to investigate why cancer rates there were soaring, she began working with a group of teenagers who were interested in what toxins were lurking in their beauty products. Teens for Safe Cosmetics played a key role in the passage of the California Safe Cosmetics Act in October 2005, and the Toxic Toys Bill in 2007. To take on broader issues, Shils also founded Teens Turning Green which engages young people from 12 years old through college age. The student-led movement started around her kitchen table in the Bay Area and now has a presence in schools across the country. The power of Eco Moms extends beyond idealism. We also have enormous purchasing power, especially when it comes to deciding what products we allow in the house. Increasingly, we are demanding stuff that is safe and respectful of our values. The result? So-called “green” product lines are proliferating. Ten years ago, there was usually one choice: go to a health food store and look for Seventh Generation. Today some of the biggest brands in household products have started green, natural lines. Gerber introduced Gerber Organic Baby Food. White Cloud has Green Earth bathroom tissue, and even Scott tissue is up to 40% recycled in their “Naturals” line. A couple of years ago Clorox launched its Greenworks line (the company also bought Burt’s Bees). But there’s also been a tsunami of bogus or misleading green claims to go with this shift, and it can be hard to sort out the truth. It’s instructive, then, to see how clear Clorox has made its Greenworks labels. (I learned that the secret cleaning ingredient in their products, alkyl polyglucoside, is extracted from coconuts.) And the Greenworks website is a model of communication; it is upbeat, even humorous, and offers easy tips for keeping unnecessary chemicals out of the house. Manufacturers are going to the trouble of appealing to Eco Moms for a reason: they are influential early adopters of products. If we buy what you’re selling, you are likely to profit from the connection. The lesson for Eco Moms is that our everyday decisions are important. They give us a sense of control over our environment, a way to feel we are making smart choices, doing something good for ourselves and our planet. But these decisions also acquire critical mass in the commercial world. Yes, rampant consumerism is part of the problem. Too much of what we buy is disposable or just wasteful. But the rising power of Eco Moms gives me hope for a change in values. We are asking, in hundreds of different ways, for healthier, more sustainable choices. And we are getting answers. But with the counterproductive regulations in place now, we cannot know the full extent of harmful chemical exposure from the products we use daily. Now it is time to leverage consumer power into legislative clout. We have to make our voices heard in Congress. 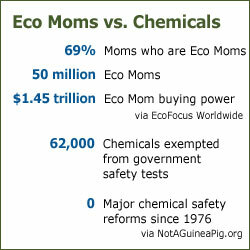 Let the new 112th Congress know that Eco Moms want immediate reform of our scandalously inadequate chemical safety laws. It is up to us to make sure that the laws that are supposed to protect us from toxic chemicals actually do. We can get this done in 2011: Never underestimate the power of mothers of nature! Please stand up for the health of your family by joining thousands of concerned moms, dads and others in signing this pledge and telling Congress to strengthen our toxic chemicals standards. We will deliver your pledge along with the thousands of others to the new Congress when it's sworn in next year. ...to dangerous toxic chemicals, which are in everything from computers to carpets to clothing to couches. These chemicals are so ubiquitous that every American alive today has hundreds of them flowing in our blood stream. And yet, America's main chemical safety law has never been significantly amended since it was adopted 34 years ago. As it is currently designed, this law does almost as much to ensure we are exposed to toxic chemicals as it does to protect us. “Hope is the thing with feathers,” Emily Dickinson wrote. In her poem, hope flutters into—and out of—our hearts, it clings to its perch through the heaviest storms, and it asks for nothing in exchange, not a crumb. Hope has been very much on my mind this summer. Every single day we learn more about the deteriorating state of our planet—the dying ocean, the melting glaciers, the disruptive, unusually severe weather patterns. Then we ponder the sorry state of our political process with respect to climate change. Where’s the hope? How neighborhood action spurred national change. My weary friends say the battle against climate change is overwhelming. The issues are too large. The battle must be global in scale and the solution has to be as large as the problem. But it is doubtful we can institutionalize international change fast enough to avert disaster. Time is not on our side. So we retreat to our homes, and think of tending only our gardens and raising our children. It is autumn, and for most of us, no matter how old we are, an internal rhythm kicks in: back to school! Back to serious matters! We buy the crayons and notebooks and lunch boxes for our little ones, and send them out the door to board those bright yellow buses, just as we did when we were in our brand new fall oxfords. We send our children out into that very large world—the one from which we want to retreat. Fresh faces on the first day of school. About a decade ago, we began to learn that those school buses we waved our children off in posed an unexpected environmental risk. Despite being the safest way to transport children to and from school, buses produced diesel fumes that can cause respiratory ailments, exacerbating asthma, and damaging lung tissue. The problems were aggravated every time the buses stopped to open their doors to pick up more passengers; more particulate pollution streamed in and entered the children’s lungs, bloodstreams and brains. Because children’s lungs are not fully developed, they are especially vulnerable. To make matters worse, idling at pickup time at the school doors added to the pollution both inside and outside the bus. When the information surfaced, it led to aggressive action across the country. New York City, Washington state, New Jersey and California instituted mandatory emissions controls programs, setting aside funds to either retire old buses quickly, or retrofit them to filter the pollution. Along with the Environmental Protection Agency, the American Lung Association threw its weight behind the issue; so did many PTA organizations. Things have begun to change. Progress is slow, and sometimes frustrating. Some fleet managers are more concerned with bus routes and schedules; some legislatures are unable to find funds to buy new buses or retrofit old ones. The retrofit costs ranging from $1,000 to $8,000 are a small price to pay for our children, and the sort of thing many companies could underwrite in an “Adopt a Bus” program. Incredibly, some people fail to give a child’s lungs and heart and brains top priority. But over and over, we have seen that things happen most rapidly and effectively when the people who do care—the parents—mobilize to demand change, and champion it through the planning and implementation stages. EPA reports that across the nation, bus retrofit programs are growing and getting better. Ten years later, district by district, across the country, our children are breathing cleaner air as they ride to school. And fortunately, even in places where nothing is done, the old, dirty buses will eventually “age out”, and be replaced with new buses designed to run more efficiently and cleanly. Here’s how you can help get our children on cleaner, safer school buses. Which gets us to that matter of hope. Of course there are times when hope fails us. We abandon it, or it abandons us. But the only alternative to hope is despair, and no one thrives with a heavy heart. To be human is to hope. The thing with feathers is small, but it is also nimble. Sometimes, when the big picture is overwhelming, it helps to zoom in tighter. Look at the ways in which we have made large changes for the better in our own small neighborhoods. Look at the successes we have had—and be reminded that we can change things for the better. The fight against global warming is not like the fight against school bus pollution; the crisis is too pervasive, for any individual action to make much difference. We need significant legislative change. But it is up to us, as individuals, to rally around transformative efforts—for our own sakes, and for the sake of our children. Sometimes, hope is the thing with a backpack—that small, cherished creature, innocent and expectant, we send out into the world’s hurly-burly. I have to believe that, one way or another, we will continue to change our ways for those children—a new generation whose own hearts are filling with hope as they pick up the fight. We are like those buses. We will age out—and we will, I hope, be replaced by our children, people who have cleaner energy on their minds. In the meantime, it helps to understand that hope is a gift, a blessing, a visitation, a grace. But it is also a choice. Get Involved! Cleaner buses are just one change of many we can make. Join a powerful new I am Not a Guinea Pig campaign to strengthen toxic chemical standards.